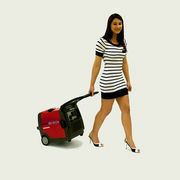 Honda has pushed themselves to the limit producing the lightest 3000 watt generator they have ever constructed. 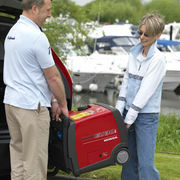 Featuring built in wheels and folding handle so you can easily transport you EU30iu Handy from point A to point B. Honda has also incorporated their microcomputer-controlled sinewave inverter into the EU30iu handy allowing it to produce commercial quality electricity. Meaning it can power computers and laptops which are frequency sensitive. Equipped with a fast multi-point alternator that is integrated into the engine itself. Which helps to reduce the weight of the EU30iu by 25-50 percent, compared to its competitors. The eco-throttle placed on the EU30iu Handy ensures the best fuel efficiency every time you start up your Honda Generator. Self adjusting to only work as hard as it needs to also lowering the noise it makes. You can also use parallel connection cables to link two Honda generators together. Doubling your output to 6Kva! The Honda EU30iu Handy generator can run up to 7.7 hours on continuous operation of a full tank of fuel (with the eco-throttle turned on). And you guessed it! 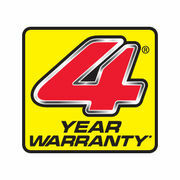 The Honda EU30iu Handy generator comes with the 4 year domestic warranty, giving you piece of mind! Honda backs their products in for the long haul, and so should you!